Hi Everyone!! Welcome to the next stop on the Getting Crafty with the Cameo blog hop! If you have come from Gaby's blog then you are in the right place. If not and you would like to start at the beginning please click here. I'm so excited to be a part of this blog hop. I am LOVING my Cameo!! For my project I created this cute little Easter treat box. Inside are some cadbury eggs. And here is a side view.. The box and bunny were both cut from the Silhouette Store. I cheated and used my Spellbinders to cut the circle. The stamp sentiment says "Spring is here, The Easter Bunny too! Here's some Candy, from me to you!" It is from Jaded Blossom "Bunny Poop" stamp set (which is ON SALE RIGHT NOW!) I also used Jaded Blossom Flag Die and stamped the sentiment right on it. Now there are LOTS of prizes on this blog hop! To be eligible to win the prizes you need to..
2) Visit the sponsors Facebook page or blog and comment letting them know that you were sent from the Getting Crafty with the Cameo blog hop! Here is the prize list..
Next up on the hop is the wonderful Sandra!! And here is the entire list in case you get lost..
very very very cute Candace! I love the bag with the Easter bunny. Thanks for giving me ideas for Easter. Super cute treat box, love this idea! I love this. I have to get this file. I love the paper you used. Oh my! This is sooo cute! Just love the bunny! Super super cute Easter project!! Love your stamps!! Your little box is adorable. Love it. Love the box. So cute. Thank you for sharing. very cute. nice way to give a small gift for easter. tfs. i'm already a follower. tooo cute chickie! love the treate bag and the die and cute stamp of course!!! love how you made the shadow green to pop the bunny! 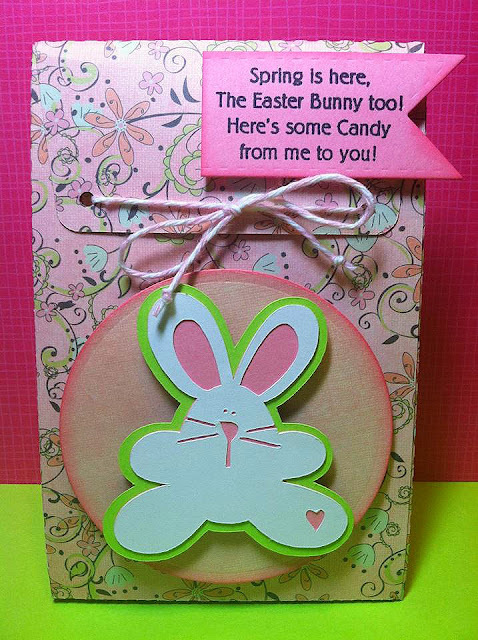 This is adorable, the bunny is so cute love the heart cutout and the stamp set goes perfect! Love the banner die too! Simply adorable...great job using your Cameo! I am a follower:) Thanks for a chance to win and for the inspiration! OMG! I love your ideas! Joined your blog, following you on Pinterest and I liked your Facebook page. What a supersweet Easter treat! Too cute! Happy to be a new follower! They are 2 cute! Thanks for the inspiration! I'll be a member of the Cameo this week! new follower also! The gift bag is so cute, and the sentiment is perfect! Your project is absolutely darling and beautiful. I am going to make one for my son's teacher! I also loved the quote you used!!! I am so happy to have become a follower on your site and on FB. I look forward to seeing your lovely creations in the future. Thank you also for a super fun blog hop. I really love your treat bag! feeling inspired and I still have time to put a few together for my girls before Easter! that bag is adorable! May just have to steal this idea! I love this....it is so cute. I am already a follower. You make the cutest things. Thanks for sharing. I'm just dying to get a Cameo ~ love the clean cuts!!! Super adorable Candace! Loving the paper for the treat box and the stamp is perfect! Great project! I think I will make one for my 5 year old to give to her teacher. She'll like that. Visiting from Scraptastical Kreations for Gettin' Crafty with the Cameo Blog Hop!! :) Love all your amazing blogs!! I am new to the Cameo and these blogs help soooo much!! this is just too cute!! love the sentiment and love those cuts! 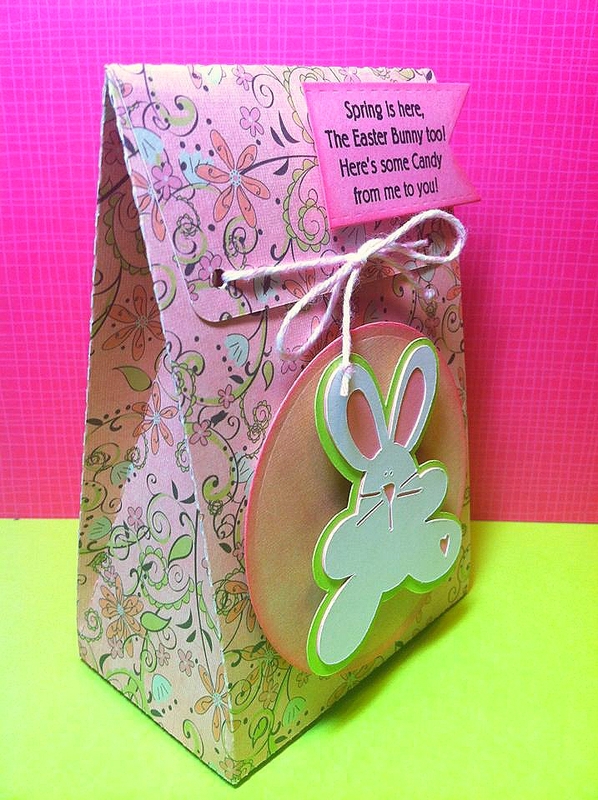 Great idea for Easter gift bags for kids. Love your cute Easter card. This is so adorable, I love that bag! Such a great little gift bag for someone special! super cute.love the bag fold and bunny. Adorable. Love the paper you used.